Keep warm in colorful beauty with our Winterfloral Cowl 2. There is a hidden surprise on the inside. 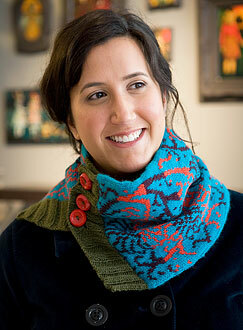 For a startlingly different color variation see Winterfloral Cowl 1. With circular needle, using A, cast on 126 sts. Join, being careful not to twist sts. Mark for beg of rnd and carry marker up. Join B. Work in St st (k EVERY rnd). Rnd 1: work Rnd 1 of Chart 1 over 63 sts, place marker, work Row 1 of Chart 2 over 63 sts. Work even in pat as established until piece measures 21” from beg. 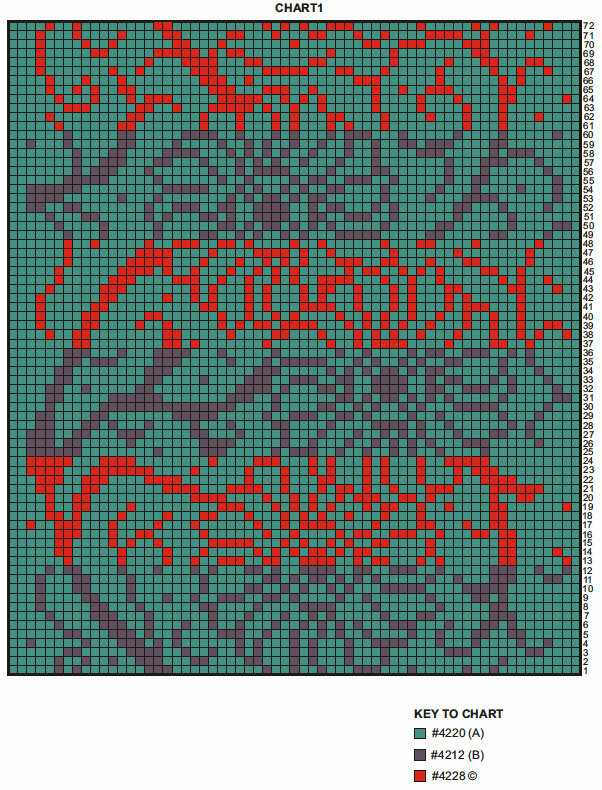 Drop B and C and knit 1 rnd with A. 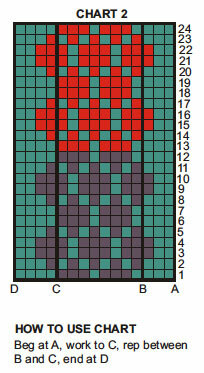 Change to D.
Next Row: Hold ends of circular needle parallel with 63 sts on front end of needle and 63 sts on back end. Using straight needle, * k1 st from front of needle and 1 st from back of needle tog; rep from * across – 63 sts remain. 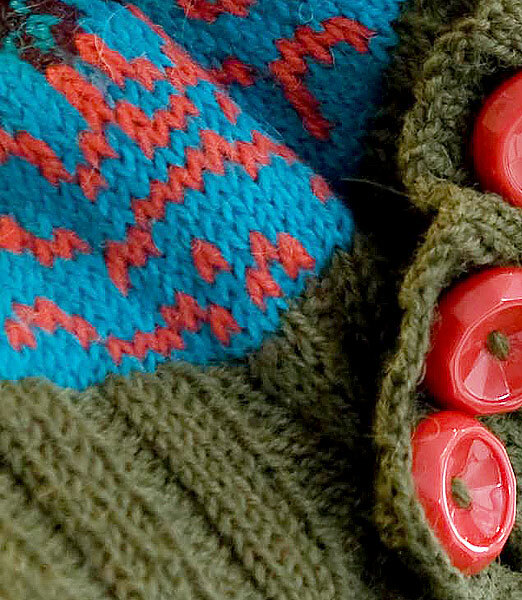 Buttonband: Ribbing: Row 1 (WS): P3, * k3, p3, rep from * across. Row 2 (RS): K3, * p3, k3, rep from * across. Rep these 2 rows until band measures 2 ½”, end on WS. Bind off in ribbing. Buttonhole Band: Fold cast-on edge of cowl in half with 63 sts in front and 63 sts in back. With RS facing, using straight needles and D, pick up and k63 sts across cast-on, working through double thickness of cowl. Work in ribbing same as buttonband for 1¼”, end on WS. Buttonhole Row (RS): Work 5 sts, bind off 4 sts, (work 8 sts, bind off 4 sts) twice, work to end. Next Row: Work in ribbing as established, cast on 4 sts over each group of sts bound off on previous row. Complete same as buttonband. Sew on buttons.